SUPAFLEX rubber expansion bellows are manufactured from E.P.D.M. with multiply nylon and steel wire reinforcing. All bellows are complete with zinc plated mild steel flanges, untied or tied with fully threaded tie rods and anti-vibration top-hat washer on oval flanges. Other polymers can be supplied on request. 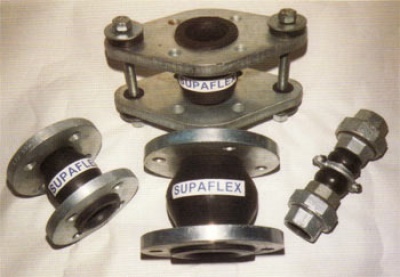 Supaflex Stainless steel pump Connectors have been optimally designed for use in pipework systems where pumps or compressors are used - to suppress noise, absorb vibration, to correct and accommodate for minor lateral misalignment or thermal movement, and to adjust for any building settlement. Manufactured with AISI 321 stainless steel corrugated tubing (to BS6501 Pt. I ) with AISI 304 stainless steel single overbraid, & carbon or stainless steel end fittings TIG welded-on. AISI 316 stainless steel also available. Braided pump connectors are not designed to absorb axial vibration ! Moderate Vibration / Noise For maximum efficiency, the connectors should be placed in both the suction and discharge lines, as close as possible & at 90" to the vibration source. They must be anchored at the pipework, on the end away from the source.